Written by Dr. Ajit Kumar Varma and medically reviewed by iCliniq medical review team. 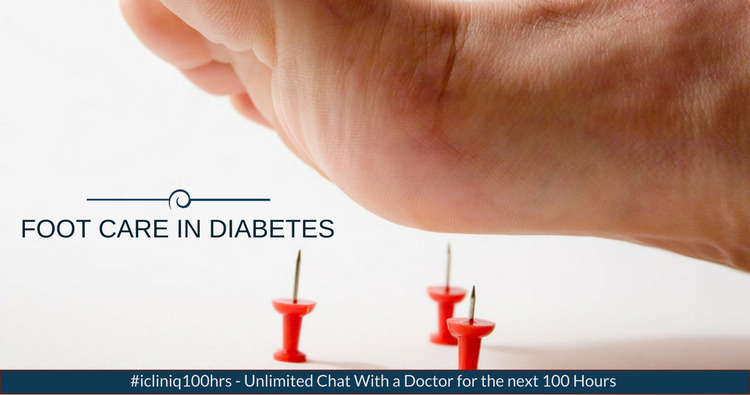 A majority of the diabetic patients admitted to various hospitals come for the management of lower limb and foot infections as well as gangrene. Most of these happen due to a poor management of the problem and also due to a general lack of awareness among the public about the repercussions of these problems. An amputation of a limb is a life-altering disability. Often, this procedure is undergone by the sole earning member of the family, and this causes a financial crisis within the household. I am your foot and want to be with you always. Please take good care of me. Inspect me twice a day to look for abnormal findings. If you find callosities or ulcerations, please consult a podiatric surgeon to prevent complications. Please check me for early signs of infections and take immediate action. If you find anything abnormal, the first and most important thing you should do is ‘offload’ me, that is, you will not bear any weight on me. If the blood circulation to the foot is low, please take the doctor’s advice to revascularize me, if required. Please consult your podiatric surgeon to discuss the best type of diabetic footwear for me. Please share these tips for foot care in diabetics with all your friends who have this condition, so that, they will take good care of their feet too. For my sake, please keep your blood sugar levels in excellent control with the expert advice of a diabetologist. Please do not allow me to be amputated, unless the infection in me threatens to take your life. Why Should Amputations Be Avoided in a Diabetic Patient? Is there any possibility of full recovery after detachment of severed right hand thumb? My grandfather is suffering from the side effects of his medicines. Please help. In diabetes, the blood vessels are the major target organs. So, all the organs in the body subsequently get involved. By the time the lower limb has a peripheral obstructive vascular disease, nearly all the organs are already affected by ischemia. The blood vessels of the heart are also greatly damaged. Many studies have shown that in a diabetic patient, walking, even with the best of a prosthesis, strains the heart by over 15%. Many studies have proven that in a diabetic patient who walks routinely with a below-knee prosthesis, there is a 50 % mortality rate in five years due to cardiac failure, and with an above-knee prosthesis, there is a 50 % mortality rate in three years due to cardiac failure. Thus, the primary reason we try to prevent major amputations in diabetic patients is not to improve the quality of life but to increase their longevity. In a diabetic patient, one of the significant tissue changes is due to ‘nonenzymatic glycation' which affects all the soft tissues in the patient’s body. This, in turn, immensely lowers the cell-mediated immunity. In such a case, if a lower limb infection occurs, and it is improperly managed, the disease can spread like 'wildfire,' and can cause a loss of limb or even life. The surgical treatment of lower limb infections in people with diabetes is managed with proper debridement. Once the infected areas are thoroughly debrided, the tissue is sent for bacterial and fungal culture and sensitivity. The patient is then administered culture-specific antibiotics and if required, anti-fungal medication. An appropriate wound dressing, strict offloading of the involved limb, and supportive therapy are necessary. Another serious foot and ankle problem which can happen in an uninformed diabetic is osteoarthropathy of the foot and ankle bones. This is also called the ‘Charcot foot.' In this condition, the foot bones become soft, and lose their density, due to the autonomic neuropathy occurring in diabetes. As an analogy, if we were to place a wooden board dipped in water for over six weeks, imagine how it would be. Soft, sodden, spongy, and friable. Is that right? So also in Charcot foot syndrome. When a patient walks with these soft feet bones, they develop fractures, erosion, and severe destruction. When detected early, they can be managed conservatively. Whereas in untreated cases, the foot and ankle bones become severely destroyed, and usually the patient is subjected to a below-knee amputation. In specialized centers though, the foot can be salvaged by doing a 'reconstructive foot and ankle surgery' with excellent results. The diabetic foot and lower limb diseases that we commonly come across include extensive lower limb necrotizing fasciitis, diabetic foot infections including gangrene with peripheral vascular disease, and Charcot’s foot, some with a marked destruction of the foot and ankle bones and grossly deformed toes and feet. These deformed feet and toes can develop high-pressure points, and callosities and ulcers, which in these immunocompromised patients are portals for bacterial entry leading, as said earlier, to limb and life-threatening infections. Hence these foot abnormalities must be surgically corrected. In many cases, a suitable molded footwear and proper foot care can avoid serious complications and prevent surgery. Do you have a question on Amputation or Complications Of Diabetes Mellitus? Why is there diabetic neuropathy in spite of being on insulin? How long would antibiotic therapy typically be tried?